Here, Garcia talks about what it was like growing up in the San Francisco Bay Area, his obsession with his first guitar, and his first encounters with early R&B, which had a profound and lasting impact on his music. After discussing his brief, but eye-opening stint in the army, Jerry offers up stories of his time spent as a student of the Beats, and his personal and reverent memories of Neal Cassady. He ponders what he sees as the complicated nature of LSD and the oppressiveness of government. He goes on to remember in detail the early days of the Dead, from their first gigs as the Warlocks and their days at 710 Ashbury Street, to the Monterey Pop Festival in 1967 and performing on the road with Jefferson Airplane. Throughout he breaks to opine on movies (one of his favorite subjects), to open up about his songwriting process and his prolific collaboration with Robert Hunter, and his admiration for a broad range of musicians from the Rolling Stones and Bob Dylan to Scotty Stoneman and Bill Keith. Dozens of rare family photographs, and other art and ephemera, many of which have never been seen before, are included here in a PDF. With an introduction written and read by Dennis McNally, and a foreword written and read by Trixie Garcia, Jerry's daughter, this audiobook is the ultimate complement to any collection. 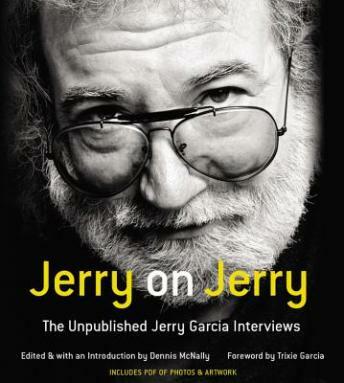 JERRY ON JERRY is one of the most revealing and unguarded portraits of the adored front man of the Grateful Dead and a true, long-awaited gift to his fans.